My eyes were opened during our family trip to eastern Europe in 2014 to learn that men like John Hus had been martyred for their religious beliefs by the Church-state of the day a century before Martin Luther, who is usually given credit for the beginnings of the Protestant Reformation. Having had then only a basic understanding of my wife’s and my historical faith, I wanted a more complete picture. This past year, during our heritage tour of Germany, Switzerland, and France, I began to piece together the connections between the early Protestant reformers, the Anabaptists, and the denominations in America today. This third section of our four-part article will explain. I believe that my wife’s and my associated families’ religious beliefs represent the coming together of the German Lutherans, the Dutch Mennonites, the Swiss Amish, the English Methodists, and the Scots-Irish Presbyterians, to name only the faiths we represent. In the final part of this article, we will look at the Amish faith, in America in particular, from which many of my wife’s ancestors sprang, and attempt answer the question of why so many people, myself included, are so fascinated by it. 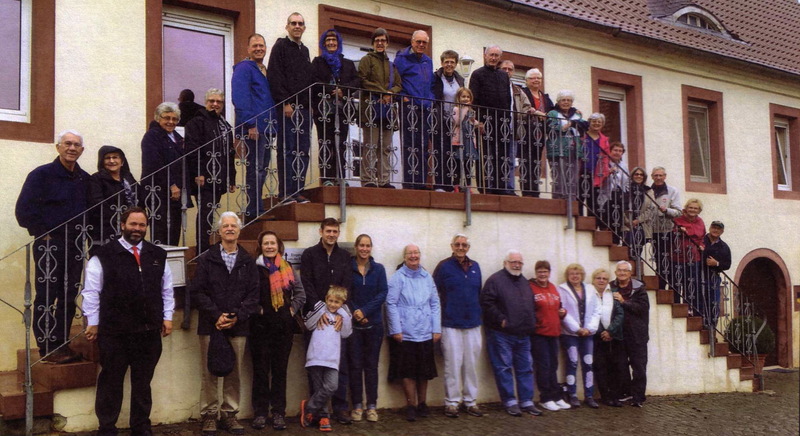 Our two-week tour was conducted by the Mast and Petersheim families of Berks County, PA, owners and operators of Masthof Publishing Company and producers of the genealogical quarterly Mennonite Family History. It’s important to note that our journey and this writing does not present the anabaptist story in full nor in any particular geographic or chronological order. This article is not intended to espouse any theology. Rather, I simply recount the experiences we had on the bus ride. Some extraneous experiences are mentioned as well. You’re invited to explore the links and footnotes within and references to already-posted articles on E-Gen.info and Works Cited below for more complete information. Most of the 35 people on our trip met at the Philadelphia Airport for an overnight Lufthansa flight to Frankfurt, Germany. 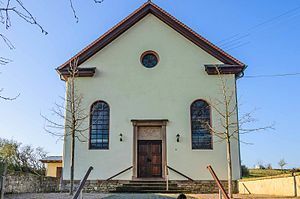 From there, the next morning, we boarded a bus for lunch in a castle in Schriesheim in southwestern Germany, birthplace and home of German Baptist minister Alexander Mack (1679-1735), founder of the American Church of the Brethren. His ancestors had survived the brutal Thirty Years War. Later, after hiking in the Black Forest (Schwartzwald), as some of our Anabaptist ancestors must have done to escape persecution in Switzerland, we saw Europe’s longest continuous waterfall in Triberg. 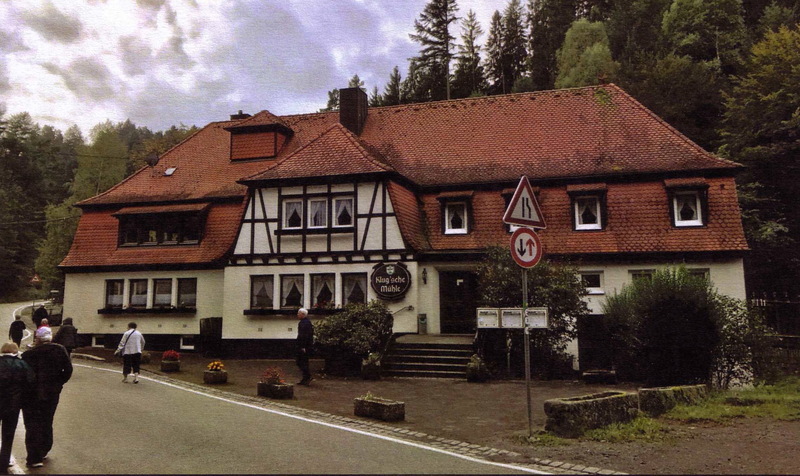 The Black Forest is known for its cuckoo clocks. Michael Sattler shall be committed to the executioner. The latter shall take him to the square and there first cut his tongue, and then forge him fast to a wagon, and there with glowing iron tongs, twice tear pieces from his body, then on the way to the site of execution five times more as above, and then burn his body to powder as an arch heretic. Other anabaptists in Sattler’s group were killed by the sword while his wife and other women were drowned. Today a museum in Schleitheim contains many artifacts from this period, including an early copy of the Confession. Pilgrims also visit the site of the execution, Rottenburg am Neckar, where a plaque commemorates the sacrifices of these founding Anabaptists. We stayed two nights at Wadenswil on Lake Zurich. The first morning, the bus took us near the Anabaptist Cave (Tauferhohle) along a challenging mountainside in Baretswil, where many outlawed Brethren met to worship. We walked on a narrow road through pastureland in the rain, but the anabaptists probably only dared travel there at night as the cave became a hide-out and place of refuge. After lunch we drove back to Zurich where the Grossmunster Cathedral awaited us. It’s massive bronze cast doors depict the story of the Reformation. This was the church of Ulrich Zwingli (1484-1531), and his statue adorns the outside. Anabaptist have some trouble here because, despite being an early inspiration to these non-violent people, Zwingli holds a sword in his hands. He was killed on the battlefield defending his ideals. Canton Zurich became a Reformed State in 1525, and the city is where the Zwingli Bible was printed in 1529. The Protestant Reformation allowed all Christians to read the sacred word for the first time. The Limmat River in Zurich is where the first execution of an Anabaptist, Felix Manz (c.1498-1527), took place by drowning in 1527. Again, a plaque marks the spot. Manz and Conrad Grebel, mentioned in the previous part, were co-founders of the original Swiss Anabaptist Brethren. 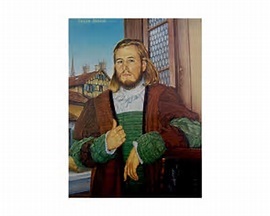 Hans Landis (1553-1614) was the last Swiss Anabaptist to be executed in Zurich. He was beheaded for his faith in 1614. This account and others as well as the names of all Anabaptists executed for their faith are recorded in the historical book Martyr’s Mirror, first published in Holland in 1690. The next morning we said goodbye to Lake Zurich and climbed the hill in the bus to Hirzel, the home of martyr Landis and learn that his three remaining children were put up for adoption, his house sold, and the money put toward the town’s Reformed church. This town is also famous as the hometown of Johanna Spyri, author of the classic Heidi, the classic narrative of life in the Swiss Alps published in 1881. As we motor toward Luzerne, we stop at the country town of Einsiedeln, who’s name means “to settle away.” The ancient monastery there was founded in 934 AD, and is home to the famous “Black Madonna.” The ornate sanctuary is in stark contrast to the plain Reformed churches in the land. Our Lady’s color originally came from years of burning candles in her veneration. It’s a steep road to the first city in the Swiss Confederation, Luzerne, founded in 750 AD, and we saw signs of the very new and the old: ski jumps which use modern technology for training Olympians year-round, and hidden military bunker built into the mountainsides. Concrete barriers are still in place that discouraged the Germans from invading during World War II. Once we arrived in the city, we saw the famous wooden bridge, originally built in 1333. How ironic that this country, known for its neutrality and peaceful nature, once housed Anabaptist prisoners in the tower at the one end of the bridge. After a short stop in Luzerne, we boarded the bus again for the scenic ride along the lake, past the place where folk lore claims William Tell shot an apple from on top of his son’s head, and then up and over the mountainous Susten Pass. The narrow road, begun in 1938, is said to be the highest paved road in Europe. Americans could learn a lot from the engineers who built Switzerland’s long, curved tunnels too. In the days that followed, the tour took us along Lakes Brienz and Thun, up the side of the Alps to the auto-less village of Murren, where we spent the night, and to the Schilthorn resort, where we ate breakfast in a revolving restaurant. What would our anabaptist ancestors have thought? After a thrilling cable car ride back to the bottom, we had lunch in the town of Interlacken, the land between the lakes. Our trip would not be complete without a visit to the Simmental Valley and the town of Erlenbach, the Swiss hometown of Amish founder, Jacob Ammann (1644-1730). More on him in our final part dedicated to the Amish, but for now you need to know that he was born and baptized in the Reformed church in the Simmental in 1644, before converting to the Anabaptist movement and being exiled to Heidolsheim, Alsace, France, and founding what was to be called the Amish Church in 1693. Our last stop of the day was in at the castle in Thun, built in the 1200s, where Susan’s Anabaptist grandfather Speicher was imprisoned for supposedly “praying in a group.” We spent the night in Oberhofen along the Thunersee. In the morning, we headed for the Emmental Region in central Switzerland, the one-time home of many Bernese Anabaptists, including our ancestors. 1. Disputation, or debates within their communities to show them the “error of their ways.” Though following correct legal procedure, the outcome could not be impartial because the jury was also the judge. 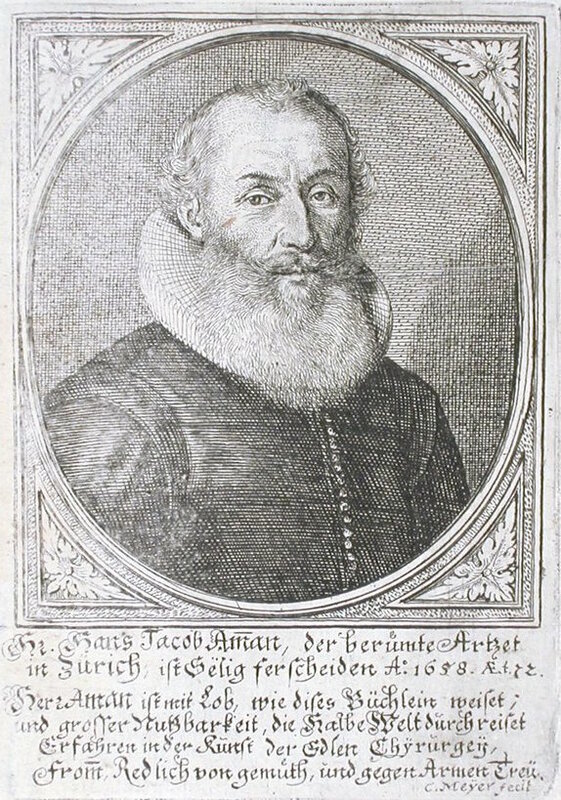 The first meeting was held in Zofingen in 1538 where Anabaptist preacher Hans Haslibacher represented his faith for which he was beheaded in 1571. He was the last martyr killed in Bern. Since 1742, a 32-verse song about the imprisonment and death of Haslibacher has been found in the Amish “Ausbund,” their traditional hymnbook. The words are included in the next section of this article. As for the disputations, after only five debates, the State realized that the results harmed their sides more than the Anabaptists. 2. Fines and imprisonment. It wasn’t long before the jails were full and the fines weren’t and couldn’t be paid anyway. A very good summation of this aspect of the persecution may be found on the Global Anabaptist Mennonite Encyclopedia Online. Sometimes, Anabaptists were housed in Bernese orphanages or hospitals so they could be “taught” the Reformed ways. 3. Exile. Many of the Anabaptists were forced off their properties and assets confiscated. Despite being banned to other cantons and countries, the rebels often returned upon the threat of death. In other instances deportation turned into emigration. 4. Death, usually by the most awful means, in public to set an example to others. The gruesome executions of Manz, Sattler, Landis, and others have been described above. 5. Tolerance. This took several forms. Seeing so many of the preceding means failing, some officials in as much said, unofficially of course, “Just declare that you’ll obey, then you can do what you want.” The Anabaptists were highly principled and against taking oaths. With the French Revolution and other wars threatening the Swiss border, the emigration of more Anabaptists to America than were left in the country, a new Helvetic Constitution of 1798 offered the Brethren alternatives to military service. Throughout the 1800s equal rights were expanded in hopes of encouraging the Anabaptist to stay. The end of persecution finally arrived, but it was probably too late. We spent the next four nights in Sumiswald, the heart of the Emmental and the farmland of our ancestors. 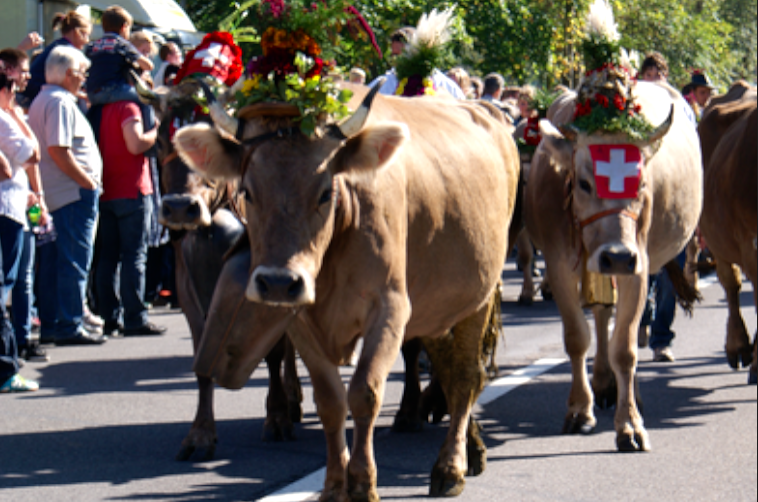 On September 15, 2017, we joined hundreds of visitors to watch the cows being led down from their summer pastures in the high meadows, an event called “Alpabfahrt.” The children are excused from school, the old folks in wheel chairs line the street, and workers take a break to enjoy the farm families leading their livestock through the streets to waiting cattle trucks to be transported to lower winter quarters. The highlight of the festival for me was the deafening sound of the cowbells. Look at the excellent amusing videos and photos online. That afternoon, we were guests at the 400-year old organic farm of the Frankhauser family. Famous for “The Hiding Place” (Tauferversteck), their barn hid Anabaptists from the Bernese authorities. Another stop was Signau and the foundation to the 1600s home of Hans Zaug, who was imprisoned before being sold to the Venetians to serve as a galley slave. Fortunately, he escaped and returned to his family. Other stops of this day included the Trachselwald Castle, built in 1200 AD, where Anabaptists were imprisoned in the 16th and 17th centuries. Sunday morning was spent worshiping in the Langnau Mennonite Church, the oldest continuous Mennonite congregation in the world, which began in 1527. 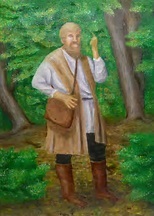 Before 1888, when the first meeting house was constructed, the Anabaptists met in homes, barns, and forests where the commissioned Anabaptist hunters (Tauferjagers) couldn’t find them. This morning, the contemporary service was led by youth from both Reformed and Anabaptist tradition. A congregational dinner was served afterwards. But another special observation was in store that afternoon: the baptism of one of us on the tour, whom we’ll call Rob. The chilly tradition was extra special because it was in the Emme River, where so many of our ancestors had been baptized. I happily admit that I also belong to that number who wish to see the sword applied as seldom as possible as a coercive against the opponents of the faith, whether they are mistaken out of principle or ignorance. And I am not so much influenced in this by those places in scripture that are cited to keep the sharpness of the sword far from the handling of matters of faith as by the unbelievable examples that occur in our time in the punishment of the Anabaptists. I witnessed how here an 80-year old woman and her daughter, a mother of six children, were lead to their deaths for no other reason than that they had denied infant baptism in accordance wight he known and popular doctrine of the Anabaptists. And this only at their own risk since it was not to be feared that two women could corrupt our world with their false doctrine. Arguably, this letter influenced the later toleration of the Anabaptists by the Reformed Church-State. By 1659 the Dutch Mennonites, many of them merchants, wrote letters of intercession to the Bernese Anabaptist Commission calling for an end to Swiss persecution. The following year, the Dutch government filed a formal protest with the cantons representing Anabaptists in Zurich and Bern. Our next night was spent in the Alsace region of France, again, rich with agriculture, where many of the Anabaptists were exiled. In the morning, the bus took us back into Germany where we began. After visiting another farm, we stopped at the small village of Trippstadt and the site of the 1688 Klugschulemuhle mill, or mill at Klug’s School. This was significant for the Zaugg/Zooks on the tour and my wife, whose Anabaptist Millers ran the operation. Today, it’s a restaurant. Another stop was Weierhof, formerly a monastery destroyed in the Thirty Years War and later, in 1682, settlement of Mennonites fleeing Swiss persecution. It remains the oldest continuous community of Mennonites in Europe. Today the Mennonite Historical Library and Archives there is visited by researchers. Aboard the bus again, we were taken to our hotel, just across the street from the Cathedral of St. Peter in Worms, built in 1018 AD, where Martin Luther worshiped before his ex-communication in that town. A monument next to the hotel commemorates the Reformation. In the morning, the bus took us to the final event of the tour, a three-hour boat ride up the Rhine River, from St. Goar to Rudesheim. We saw many of the same towns, castles, some in ruins, fields, and vineyards our Anabaptist ancestors must have passed some 300 years ago on their way to Holland and eventually America. After spending our last night of the tour in the touristy town of Rudesheim, we took the bus to the Frankfurt Airport and began our flight back to Philadelphia. Most of our Anabaptist ancestors also landed in Philadelphia before heading upriver to Germantown and then west to Amish-Mennonite country. Their boat ride(s) from took weeks and even months, whereas ours took only a few hours. Theirs was rife with hardship, disease, and even death. Ours was accompanied with good food, snacks, and every manner of audio and video entertainment. God has been good to us, but He was good to our ancestors, whether in life or death, and that death occasionally coming in defense of their faith. After exploring some or all of the additional sources below, please continue reading the final installment in this four-part series, a look at our Amish in America. The logic in including this information here has to do with the fact that my wife Susan’s grandmother, Annie Lee (1885-1971) was Amish before marrying German Lutheran, Charles Frederick Krause (1884-1973). In light of our celebration of the Protestant Reformation this year, and the contributions of the Anabaptists, which Susan and I investigated on our European tour, our Somerset County, PA, Amish surely provide a solid, simple, tangible foundation of faith and culture for our family’s journey that followed: Lutheranism, Presbyterianism, and Methodism.